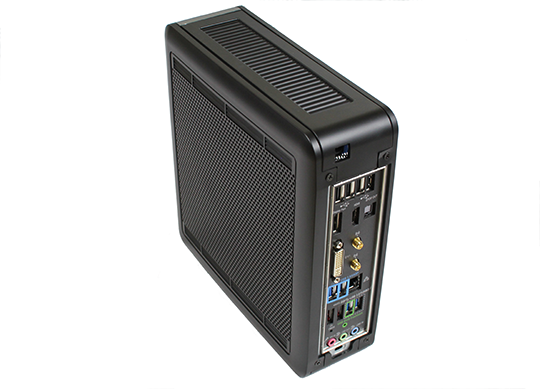 The Antec ISK-110 VESA mount is a mini ITX case that comes with an internal, fan less 90w power supply. I recently was looking for a new HTPC case for the ASUS P8Z77-I Deluxe. My goal was to make a speedy current generation HTPC that could easily handle anything I threw at it. When I asked for recommendations, the Antec ISK-110 is a very small chassis meant for mITX motherboards. One of the big advantages to the Antec case is that it comes with a fanless power supply to keep things extra quiet and cut costs. The entire case plus power supply cost me less than my 150w PicoPSU-XT. Let’s take a look at a really nice HTPC case and see if there are any areas for improvement. I ended up using two configurations for reasons I will detail below. The first configuration was going over the power supply’s recommended ratings due to the Core i7-3770K and the ASUS P8Z77-I Deluxe which as mentioned in that review, has tons of features built-in. As a result I finally swapped to the second AMD E-350 solution for real world testing. Having had to swap the configuration, the Antec ISK-110 is a very tight package that was not overly difficult to install, but there are some times when a specific configuration may make cable routing and installation challenging. Still, neither installation took more than 15 minutes. The front of the chassis is really sleek. One gets a power button and four USB 2.0 ports (yes it would be nice to see USB 3.0 ports in a current revision.) What really stood out for me is the fact that the chassis is very well ventilated. From the angle below, one can see that air circulation is not going to be an issue. Looking from the opposite angle, one can see that the rear of the chassis is also sleek. 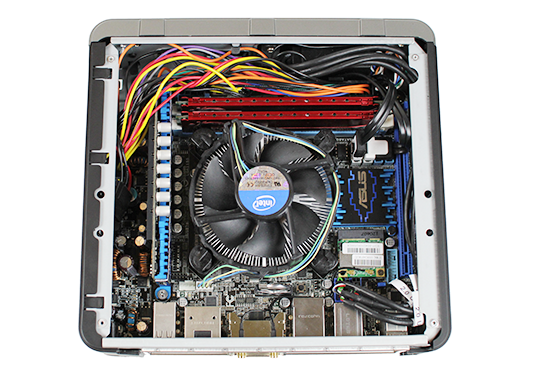 There is a standard rear I/O shield cutout which makes mini ITX motherboard installation easy. One thing you can see here is that although the chassis looks fairly sleek, there is a huge difference between the lines of this chassis and a modern HP, Dell, or Apple PC. One can see the large gaps between chassis pieces. That lowers manufacturing costs, but does detract from clean looks. 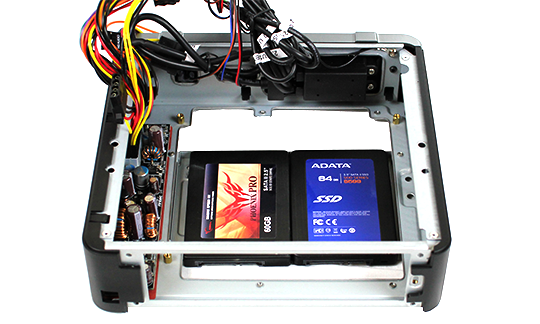 Inside the chassis one has room to fit up to two 2.5″ drives as I mocked up below. Odds are a lot of folks will be using a small boot SSD here and streaming media from Netflix, Amazon, or a media server. Once the motherboard is installed, things do get cramped. One needs to remember that more features usually mean more components which in turn mean less room in the chassis. The wires are fairly long but proper cable management is very difficult due to space constraints. I did manage to clean this up a bit, but there is only so much room to the rear of the motherboard, especially with two drives installed. I will note the Intel Atom and AMD Brazos builds tend to be much cleaner as they do not have the VRM power PCB or the huge heatsink-fan assemblies seen below. The power supply is a very mixed bag. I purchased the Antec ISK-110 thinking that the power supply was a 110w unit. A valuable lesson learned here is to actually read specs not try to interpret part numbers (especially incorrectly as I did.) Bottom line, I would see the unit with the Intel Core i7-3770K at stock clocks and voltages start the boot process sending the power draw over 92w then the system would shut down. I got a bit frustrated with this so shortly thereafter I this became my AMD E-350 chassis. One last point of note is that the VESA mount version comes with hardware to mount the chassis to the back of a HDTV or monitor so long as there are standard VESA mounting points. I purchased the VESA version thinking it was a great idea, and I can see how it could be, but placing the PC behind the screen means that physical access to the box becomes much more difficult. In the end I did not take advantage of the VESA mount, but I can see how some will use it. This is a solid HTPC chassis so long as you are not going for top-of-the-line internal components. While having a fast CPU, Bluetooth, WiFi and etc may make for a fast HTPC, 90w is not enough to power it at boot. 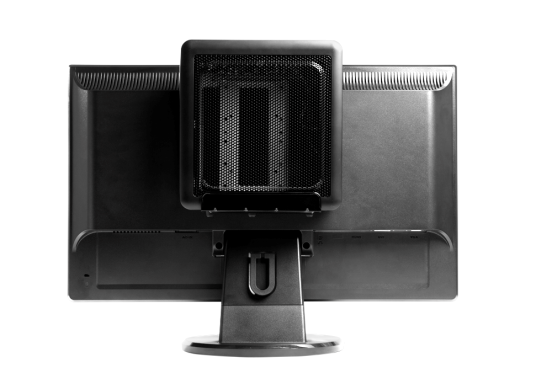 I am not sure how useful the VESA mount is since there are a lot of monitors that have non-standard mounting patterns and things such as wall mounts on HDTV sets may interfere with mounting to the rear of a screen. Still, the box does look good sitting next to a TV or monitor. 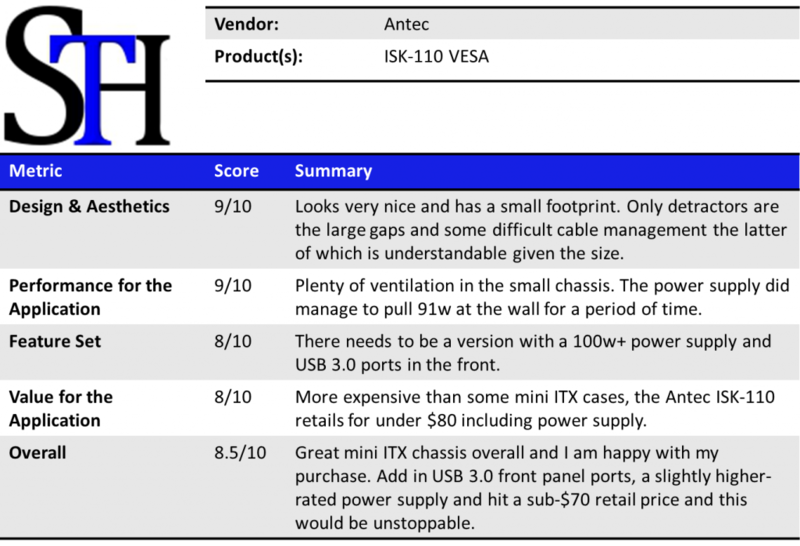 Overall, I really like the Antec ISK-110 VESA except for one minor point, the power supply. It is absolutely great for a really low power PC. On the other hand making it a 140w unit would give access to a much broader range of hardware and probably add a few dollars to the price tag. The bonus is that one would not have to worry about using low power components. Realistically the Intel Core i7-3770K system only pulled over 90w on boot and there are a wide variety of options to get lower power consumption from lower-power CPUs to undervolting, to less feature-rich motherboards. Antec, please release a 150w version!!! With that being said, I think that the Antec ISK-110 is a great chassis for a HTPC build. Previous articleThe LSI 9202-16e Host Bus Adapter – 5,000MB/Second anyone? Thanks for letting us know about that PSU. Antec needs at least a 125 watt power supply for HTPC peeps. Thanks for your review. 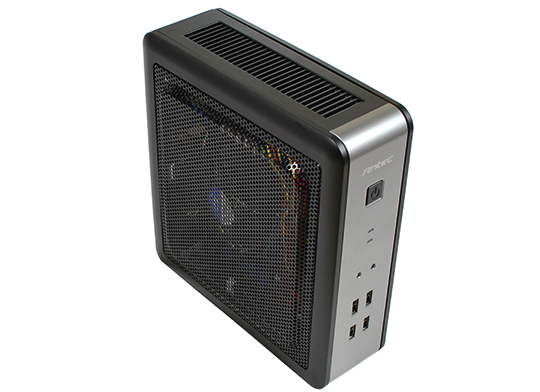 Also like this case and it looks as if Antec has no plan to upgrade it. They have other other 150 W chassis in their product line. Do you think one could replace Antec power supply with a pico PSU 160 xt power converter and its external brick? Alternatively, do you think a 45W Core i7-3770T would be sustained by the untouched enclosure and its standard power supply? Agreed. 90w is too low. Ivy Bridge may peak high during boot, but then runs much lower. 90W is plenty. If you want to use i7, you should look for other cases; this is meant for small office work / htpc applications. Put an i3 in there, you will be happy. By keeping the PSU at 90W, they also made sure it was a bit smaller as well. Nobody wants one of those huge bricks, almost the size of this case, on their desks. If you do, there are plenty of replacement PSU’s out there, get one of them.